More and more Americans believe in #ClimateChange. When will lawmakers catch up? 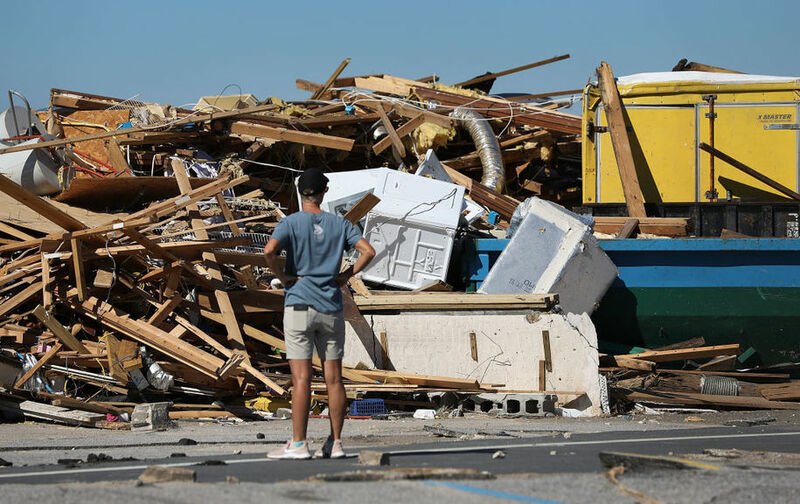 Increased frequency of extreme weather events, like Hurricane Michael in Mexico Beach, Florida, is causing people to feel the effects of climate change personally. Defying GOP denial, a growing number of Americans now say they believe that climate change is happening — and is affecting them personally. A new report says that 73 percent of Americans believe that the climate is changing, and 72 percent say that change is personally important to them. “The proportion of Americans who are very worried about global warming has more than tripled since its lowest point in 2011,” says the report’s executive summary. The report comes from a survey by the Yale Program on Climate Change Communication and the George Mason University Center for Climate Change Communication. Besides the increase in beliefs about climate change, 62 percent now say that such change is caused by human actions, an increase of 10 points since 2015. Only one in seven Americans believes that global warming is not occurring. The Yale survey results mirror the findings of a similar new poll by the University of Chicago and the Associated Press-NORC Center for Public Affairs Research, which found that seven in 10 Americans believe in climate change. That poll measured how much the public is willing to pay to counteract the effects of global warming. A $1 surcharge to a monthly electric bill to fight climate change was OK with a majority of Americans, but more expensive surcharges gained less support. Overall, 44 percent were in favor of a carbon tax compared with 29 percent opposed. This is why Democrats are willing to tackle the problem, with many lawmakers willing to sign on with an ambitious program like the Green New Deal, even as the details of that deal are still being developed. Republicans, unfortunately, are busy sticking their heads in overheated sand. You can link to the entire report here. There’s nothing like seeing footage of burning homes in a California wildfire or photos of rubble where houses once stood after a hurricane to convince people that the problem is real and getting worse. A story on the AP-NORC poll in The Hill explained that personally experiencing extreme weather events is behind the uptick in attitudes. Those experiences also have led to a limited willingness to pay a price to counter the effects of climate change, the poll suggested. Three-quarters said weather events like hurricanes, droughts and floods influenced their views, the most of any of the options polltakers presented to respondents. News flash, Donald: It’s winter. And massive winter storms are just one manifestation of global warming. Hey, at least Trump is not saying that climate change should be left to a “much higher authority,” as Press Secretary Sarah Huckabee Sanders claimed on Fox News. More immediate action is being tried at state and local levels. States have passed their own laws and regulations, with California leading the way with an ambitious set of energy laws. But it’s not the only state doing so. The U.S. Climate Alliance was formed by a bipartisan group of governors (most are Democrats, but not all) representing states that are taking their own actions to fight climate change. The alliance originally had 12 members and is now up to 17 states and Puerto Rico. Illinois became the newest member in January when new Gov. J.B. Pritzker signed an executive order to join the group. If your state isn’t part of the list (California, Colorado, Connecticut, Delaware, Hawaii, Illinois, Maryland, Massachusetts, Minnesota, New Jersey, New York, North Carolina, Oregon, Rhode Island, Vermont, Virginia, and Washington), it’s worth contacting your state officials to find out why and to apply a little pressure. States are continuing to lead on climate change. All of the states recognize the serious threat to the environment, people, communities, and the economy. State-level climate action is helping the economy and strengthening communities. These states are creating new jobs in clean energy industries while cutting air pollution and boosting public health. Climate Alliance states are showing the nation and the world that ambitious climate action is achievable. The alliance now “represents 43 percent of the U.S. population and a nearly $10 trillion economy. The climate and clean energy policies of these states have created 1.4 million renewable energy and energy efficiency jobs, equivalent to over half of all clean energy jobs in the United States,” according to the alliance website. So states representing nearly half the U.S. population are moving ahead with their own programs. But it’s going to take replacing GOP troglodytes, starting at the top, to really make a difference. Originally posted on Daily Kos on Jan. 27, 2019.